Patsy Hemmerle, 87, passed away on Saturday, October 20, 2018 at Duke University Hospital in Durham. She was born in Durham, the daughter of the late Grover Herman Price and Ethel Thompson Price. In addition to her parents, Patsy was also predeceased by her husband, Joseph H. Hemmerle, and brothers Aubrey Price, Morris Price, and Alton “Buddy” Price. Patsy was a devoted wife and mother. She enjoyed being with her family, reading, traveling around the world, and watching Carolina basketball. She also was active in her church, Asbury United Methodist Church for over 60 years. 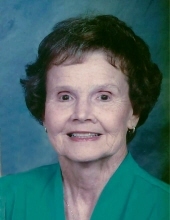 She served on many different committees and was the treasurer for the Ralph Mitchell Sunday School Class for many years. Patsy retired from the Accounting Department of FCX, Inc. after 30 years of service, and then enjoyed volunteering with Meals on Wheels with her husband for many years. Patsy is survived by her daughters, Anne and Lisa Hemmerle, and her son, Steve Hemmerle. In addition, she is survived by seven nephews, four nieces, and their families, whom she loved dearly. The family will receive friends from 6 to 8 p.m. on Friday, October 26th at Clements Funeral Home in Durham. A funeral service will be held at 11 a.m. on Saturday, October 27th at Asbury United Methodist Church with Rev. Wesley Neal officiating. Burial will follow the services in Maplewood Cemetery. In lieu of flowers, donations can be made to the American Heart Association at 3131 RDU Center Drive, Suite 100, Morrisville, NC 27560, or to Asbury United Methodist Church at 806 Clarendon Street, Durham, NC 27705. To send flowers or a remembrance gift to the family of Patsy Hemmerle, please visit our Tribute Store. "Email Address" would like to share the life celebration of Patsy Hemmerle. Click on the "link" to go to share a favorite memory or leave a condolence message for the family.